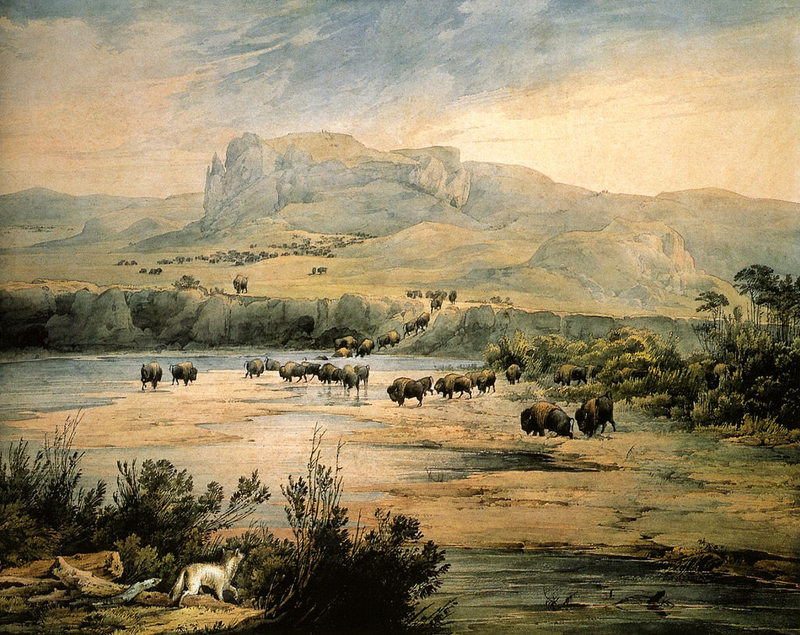 Karl Bodmer (11 February 1809 – 30 October 1893) was 23 years old when he accompanied explorer, ethnologist and naturalist Prinz Maximilian of Wied-Neuwied (23 September 1782 – 3 February 1867) to the interior of the current United States. Other ethnologists and naturalists chronicled the final days of Amerindian tribes, but few hired an artist who would adorn the account of their travels. Prinz Max, as he was known to his entourage, is the author of Maximilian Prince of Wied’s Travels in the Interior of North America, during the years 1832–1834 (Reise in das Innere Nord-Amerikas ). 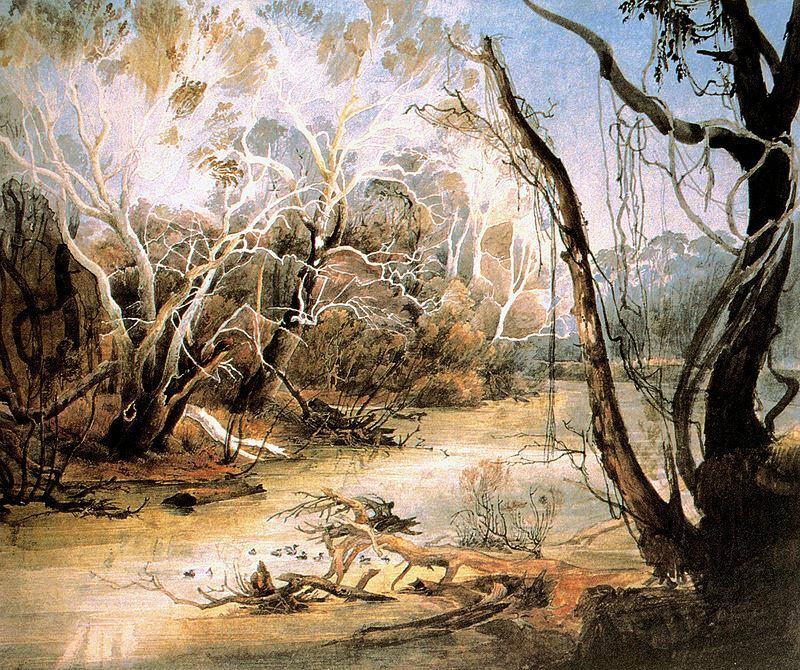 On his return to Europe, Karl Bodmer moved to Paris where he transformed his watercolours into 81 aquatints. These would adorn Maximilian Prince of Wied’s Travels in the Interior of North America, during the years 1832–1834. Bodmer later settled in Barbizon, France, and joined members of the Barbizon school, artists living near the Forest of Fontainebleau who advocated realism. Gustave Courbet and Jean-Baptiste-Camille Corot were colleagues. Bodmer also became a French citizen. Prinz Maximilian of Wied-Neuwied and Bodmer met at Koblenz, Germany. Prince Maximilian, Karl Bodmer and taxidermist David Dreidoppel set out for America on 17 May 1832. Their trip to the interior of North America was delayed because of an epidemic of cholera. They had arrived in Pittsburg on 4 July 1832 but did not leave until 8 October. First, they travelled down the Ohio River and reached Mt. Vernon, Indiana during the late evening of 18 October 1832. The next day they continued to New Harmony, Indiana but went no further. The Prince had fallen ill, showing symptoms that suggested cholera. Our team of three left for St. Louis, Missouri in April 1833. Prince Maximilian took copious notes and, as we have seen in a post on the Mandans, white Amerindians, he investigated the origin of the Mandan people, some of whom were said to be the descendants of a Welsh colony. 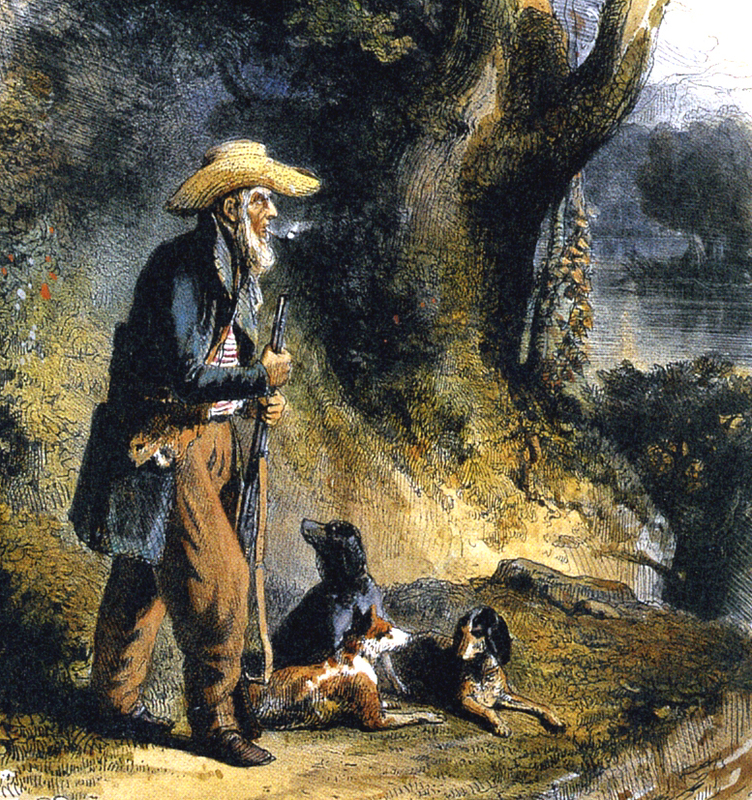 Once the Prince had collected the information he required, he, his artist, and his taxidermist returned to Germany, but, as we have seen above, Karl Bodmer soon left for Paris where he prepared the aquatints Prince Maximilian used to illustrate his four-volume account of his expedition to North America. In 1877, Bodmer was made a Knight in the French Legion of Honour, Chevalier de la Légion d’honneur, France’s most prestigious decoration. 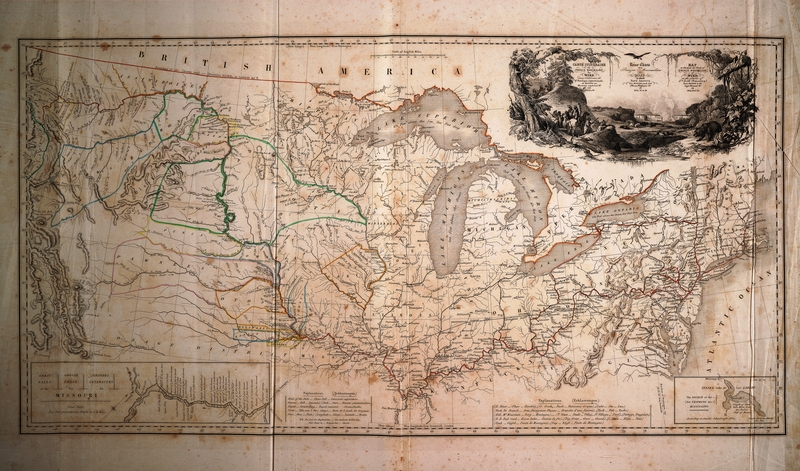 Bodmer died in Paris, at the age of 84, about forty-four years after the publication of Maximilian Prince of Wied’s Travels in the Interior of North America, during the years 1832–1834. As for the Amerindians whose manners and customs the Prince chronicled and Bodmer depicted, many died. Some were victims of massacres perpetrated by the whites. But they were also, if not mainly, victims of communicable diseases brought to the Americas by the whites. Smallpox epidemics were the worst killer and there is some evidence, perhaps inconclusive, of at least one induced smallpox epidemic, spread by blankets. As a weapon, germs seem more lethal than guns and bombs. 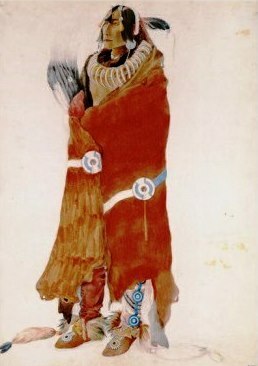 In 1837–1838, the Mandan tribe was decimated by a smallpox epidemic and its remaining members banded with the nearby Hidatsa and Arikara who are now the Three Affiliated Tribes of the Fort Berthold Reservation, composed of the sedentary Mandan and Hidatsa peoples and the semi-nomadic Arikara. Members of these three tribes spoke, and perhaps still speak, a Caddoan language. 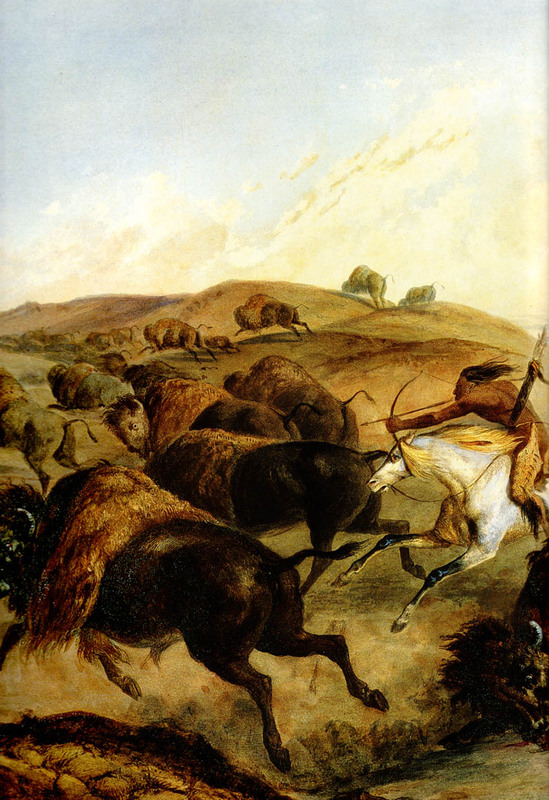 They lived in earth lodges and used the travois, first pulled by dogs and later by horses. And all were farmers who also required the bison for their survival. In the early days of New France, the summer of 1639, to be precise, smallpox reduced the Huron or Wyandot population, living from the great lakes to the Saint Lawrence River, to 9,000, half its former size. A significant number of disfigured Amerindians committed suicide increasing the death toll smallpox caused. Their appearance was very important to Amerindians who devoted long hours painting themselves. The greatest harm visited upon North American aboriginals is psychological. We often look upon ourselves as we are perceived. “L’enfer, c’est les autres[,]” (Hell is other people), wrote Jean-Paul Sartre (Huis Clos). 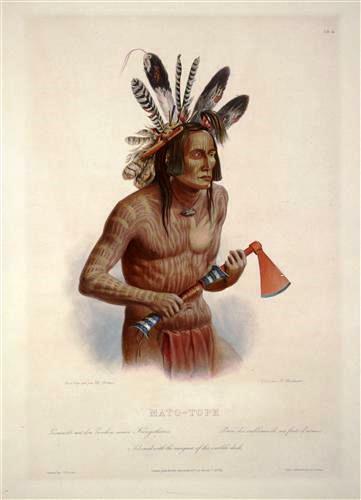 The Cherokees‘ best hope may be their conviction that they are members of the Ten Lost Tribes, which they may be. Essential to the survival of a people is its glorious past, remembered and retold from one generation to the next. 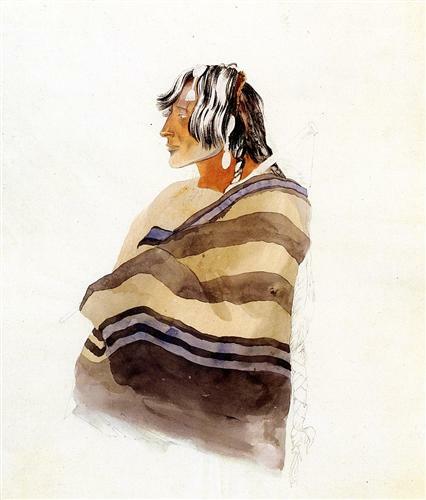 As for Amerindians who are not descendants of the Ten Lost Tribes or white Native Americans Madoc left behind in 1170, they may take genuine comfort in the artwork they have inspired, their own art and other accomplishments, the interest they have aroused among social scientists and anthropologists: ethonologists, folklorist, psychologists, sociologist, &c.
P.S. My “pages” still exist, but they are in hiding. “Barbizon school”. Encyclopædia Britannica. Encyclopædia Britannica Online. During the French and Indian War, Jeffery Amherst, 1st Baron Amherst, Britain’s commander in chief in North America suggested using smallpox to wipe out their Native American enemy. Horses had become extinct because of climatic changes that also led to the extinction of the very large mammoth. Johann Georg Kohl, Kitchi-Gami: Life Among the Lake Superior Ojibway (Minnesota Historical Society, 1985 ), Chapter II.